In surgical clinics, long postoperative hospital stays are usually not desirable due to their associations with infections, high cost, depression and similar psychological consequences. Even in clinics where surgical operations requiring short term hospitalizations, such as ear-nose-throat (ENT) operations, patients are tried to be mobilized to go home as soon as possible. It has been shown in a review by Wu et al,  in 2002 that pain was an important variable among the factors that delay the discharge of the patient in the postoperative period. In Nielsen et al's  study in 2004; pain has been shown to be an important factor that precludes returning to work and limits routine daily activities. The aim of this study was to investigate the relationship between preoperative anxiety and depression levels and postoperative pain, analgesic requirement, development of complications and duration of hospital stay in patients with benign ENT diseases which have short duration of postoperative hospitalization. One hundred and three (N=103) subjects [male 56 (54.4%), average age 25.63 ± 10.8; female 47 (45.6%), average age 22.79 ± 7.06] who had surgical operations due to benign ENT disease such as chronic tonsillitis, septum deviation, external nasal deformity, chronic otitis media, chronic sinusitis and benign saliva gland tumor between May-September 2009 participated in the study conducted in Cumhuriyet University hospital. For the research, it was taken an approval from Cumhuriyet University Clinical Research Ethics Committee and a signed informed consent paper from all patients. Age, gender, education, occupation, cigarette and alcohol use, medical history, preoperative depression and anxiety and Visual Pain Scale levels in the first postoperative three days, duration of hospitalization and postoperative analgesic use were evaluated. The exclusion criteria were impaired communicative or cognitive abilities, neurological disease, diabetes mellitus, hypertension, malignancy, renal failure and use of opioid medications. None of the subjects included in the study had a medical history of chronic disease. All cases were followed up for their wound recovery after the surgery and for complications like bleeding and inflammation. None of the subjects had a postoperative complication and wound recovery was uneventful with normal progression for all of the participants. Sociodemographic form was administered to all subjects. This form, which was developed for the study, includes the age, education, marital status, occupational status and medical history and cigarette and alcohol use of the participants. Hospital anxiety and depression scale (HADS) developed by Zigmond and Snaith  were administered to all subjects in the preoperative period in order to determine the levels of anxiety and depression and to measure the change in their severity. This scale was adapted to Turkish and reliability and validity findings were published by Aydemir et al. The HADS is a 14-item scale with two sub-scales; one measuring depression, the other measuring anxiety. Each item is rated from 0 to 3. Scores are summed up separately. For the Turkish Form of HADS, cut off score for anxiety scale was 10 and cut off for the depression scale was 7. After collection of preoperative data, pain severity was rated by visual analogue scale (VAS) on the 1 st , 2 nd and 3 rd postoperative days by the participants. VAS 2 and VAS 3 ratings were not present for subjects who were discharged in the postoperative 1 st day and VAS 3 ratings were absent in subjects discharged in the postoperative 2 nd day. The patients' postoperative analgesic medication needs, the routes of analgesic application, duration of wound recovery, development of complications and the duration of hospital stay were monitored and noted down by the clinician. Analgesics were not applied routinely to the study participants; the route and frequency of analgesic application were determined according to the pain severity of the subjects. Contraindications to the specific agents were also noted. Some groups of analgesics (500 mg parasetomal tablet) were applied orally and intravenously while 1 gram Dipyrone ampoule (1 g/2 ml) was applied intramuscularly. Subjects were able to ask for changing the dosing regimen by rating their pain severity. The SPSS 14.0 software (SPSS Inc., Chicago, IL, USA) was used for data analysis. In comparing the data presented as proportions, Chi-square test was used, for other evaluations Pearson and Sperman correlation tests were used. Age range of female and male subjects were similar [male 56 (54.4%), female 47 (45.6%)], male 22.5+9.99; female 21.0+7.06) While 64 of the subjects (62.1%) had high school education and above, 39 of them (37.9%) had lower level of education. Sixty seven subjects (65.0%) were unemployed, 36 of them (35.0%) were employed. While 95 of the subjects were not using alcohol, eight of them (7.8%) reported rare alcohol use. Seventy one of the total number of participants (69.0%) reported cigarette use, seven (6.8%) reported past history of smoking and 25 of them (24.3%) had never smoked. Duration of hospital stay for 11 of the subjects (10.7%) was one day, for 73 of them (70.9%), it was one to three days and for 19 of them hospital stay lasted between four to ten days. These data are summarized in [Table 1]. Eighty six subjects required analgesic medication in the postoperative one to five hours. Data for route and frequency of analgesic application are summarized in [Table 2]. The Visual Pain Scale scores rated in the 1 st , 2 nd and 3 rd postoperative days are summarized in [Table 3]. The depression and anxiety scores of subjects are presented in [Table 4]. Depression and anxiety scores of the subjects were positively correlated in the medium range (r=0.34, P<0.001). There was medium level positive correlation between the anxiety level of the subjects and postoperative the 1 st day Visual Pain Scale score (r=0.30, P<0.002). Although there was a weak negative correlation (r=0.06, P>0.05) between the duration of hospitalization and the Visual Pain Scale scores rated on the 1 st postoperative day, this correlation was not statistically significant. While there was a medium level negative correlation between the duration of hospitalization and the Visual Pain Scale scores rated on the 2 nd postoperative day (r=-0.43, P<0.001), there was a strong level negative correlation between the duration of hospitalization and the Visual Pain Scale scores rated on the 3 rd postoperative day (r=-0.54, P<0.001). While there was a medium level correlation between the frequency of analgesic application and Visual Pain Scale scores on the postoperative 2 nd day (r=-0.27, P<0.006), there was a weak negative correlation between the duration of hospitalization and Visual Pain Scale scores rated in the 3 rd postoperative day (r=-0.23, P<0.019). This study was to investigate the relationship between the level of their anxiety and depression in the preoperative period and the perceptions of pain level in the postoperative period analgesic requirement, development of complications and duration of hospital stay in patients with benign ear-nose-throat (ENT) diseases with the HADS and VAS. It is remarkable that the literature usually has a tendency of publishing the studies comparing the long duration of postoperative hospitalization but in our study was to investigate short duration of postoperative hospitalization period. High level of postoperative pain has been one of the most important factors increasing the cost and extending duration of hospitalization. Wallace  and Brander  have shown that there were associations between preoperative anxiety and the increase in the postoperative pain and duration of wound recovery. Anxiety has both psychological and physiological influences on the organism. Physiological consequences include increase in the blood pressure, the number of respirations and the pulse, increased perspiration, muscle tension, dyspnea and cold sweating. Anxiety is closely related to many hormone and neurotransmitter systems such as noradrenergic system, hypothalamo-pituitary-adrenal system, corticotropin releasing hormon, neurosteroid, arginine-vasopressin, dopamine, serotonin, gabaergic system and cholecystokinine. Immune system relations have also been hypothesized because of these mentioned relations. In this study it was found that 22.3 % of the subjects had clinical level anxiety before the operation. Similar findings were reported in the literature. , Psychological factors such as anxiety and/or depression have been reported to be important predictors of the postoperative pain status. There was positive correlation between preoperative anxiety and postoperative pain levels in this sample. Studies carried out on this topic have indicated that postoperative pain and hospital costs could be minimized when patients with high level of anxiety were identified and treated appropriately in the preoperative period. Many studies have been reported that interventions directed to preoperative anxiety improved postoperative behavior and recovery. , Levandovski et al,  reported that diazepam-treated patients undergoing abdominal hysterectomy showed lower postoperative anxiety and lower incidence of surgical infection up to 30 days after surgery compared to patients treated with placebo. Besides medical treatment, different methods such as pychoeducation,  music,  hypnosis  and relaxation  have tried in order to reduce the pain level after the surgery. Seers et al,  have reported that jaw relaxation in patients with orthopedic surgery resulted in a low, brief additional amount of pain relief, and they have suggested that this small benefit was perceived significantly by the hospital staff and patients. The results of these studies have implications for future studies for the use of new techniques to reduce the anxiety level before surgery. Anxiety and depression co-morbidity is common; , the existence of one can increase vulnerability to the other. For this reason it is important to do inquiry about anxiety if there is depression and vice versa. Treatment targeting both of the symptoms might be a good clinical approach. In this study there was positive correlation between preoperative anxiety and depression scores. Pelgur's et al,  has reported similar findings in patients operated for a positive correlation between anxiety and depression. It wasn't confirmed a relationship between preoperative depression scores and postoperative pain, analgesic requirement and duration of hospitalization. Studies have controversial results for the relationship between preoperative depressive symptoms and postoperative parameters in the literature. Öztekin et al,  found no relationship between preoperative depression and postoperative pain in a study with 30 football players who had anterior cruciate ligament surgery. Although there have been studies counting depression among the predictors of the postoperative pain, anxiety has been reported to be a more significant factor. The relationship between depression and chronic pain has been a commonly reported entity in many studies, but this relationship remains controversial for acute pain. ,, While the contributions of depression to the chronic pain process are more prominent, anxiety seems to have more influence on acute pain. In a recent review of Henrich-Rocker et al,  depression has been reported to be one of the most significant predictors of chronic postoperative pain. These findings highlight the importance of presurgical psychological evaluation besides physical examination and assessments. Similar findings have been reported in several articles, but it should be noted that in practice psychological evaluations are usually overlooked. Short screening for anxiety and depression could be possible with a scale like HADS which was also used in this study. This type of evaluation may be important for necessary psychological interventions and treatments. In this study there was no relationship between the subjects' demographic features and pain levels after the operation, duration of hospitalization and analgesic requirement. When patients didn't report pain or when they had low level of postoperative pain, duration of their hospital stay was shorter. 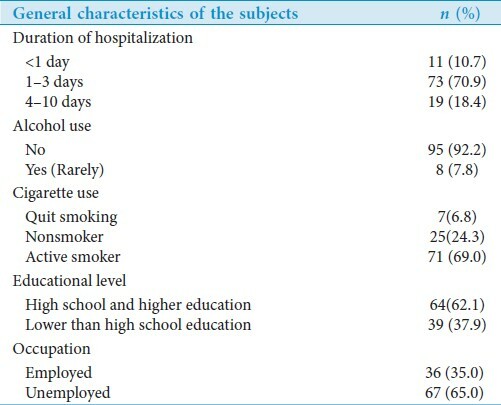 There was no relationship between the pain level in the first day after the operation and duration of hospitalization. The type of the surgery seemed to have more influence on the duration of hospital stay; for instance while patients with tonsillectomy were hospitalized for a day, those with septum surgery stayed three days and with ear operations were hospitalized for 7 to 10 days. Negative correlation between low pain levels in the 2 nd and 3 rd days after surgery and the duration of hospitalization might be due to discharge of most of the patients without pain. Longer hospitalization requirement was due to the type of the surgery, but since the study hypotheses tested the relationship between postoperative pain and duration of hospital stay, the results could be misinterpreted as there was a relation between low pain levels and duration of hospitalization. It appeared that the patients were still in the hospital, although they had low pain levels in the second and third postoperative days. There was no relationship between pain after surgery and duration of hospitalization in the group who had ENT operations. In longer hospitalizations however the patients did not report any problem because pain was well-controlled and there were signs of wound recovery. Studies in the literature about postsurgical pain have indicated that well control of postoperative pain increased patients' satisfaction  and decreased their duration of hospitalization. In a review by Perkins et al,  it was reported that, good analgesic support increased patients' cooperativeness, shortened wound recovery time and duration of hospitalization, and these patients experienced less pain after the operation. In this study, there was a statistically significant negative correlation between the frequency of analgesic application and the pain level on the second day after surgery. These results indicate the importance of identification of pain and depression/anxiety of the patients and providing appropriate interventions which might have a role in increasing patient satisfaction. Cross-sectional design of the study permitted reporting present anxiety and depression levels before surgery, but did not give information about retrospective or prospective course of these conditions; thus we did not have information about continuity and the nature of the anxiety (state or trait). Another limitation of this study might be the small sample size. Although ENT patients who require short period of hospitalization were included, diagnoses and operation techniques were not uniform. Studies on larger samples would provide more valuable information. There were no complications in 103 patients included in this study. For this reason, the relation between the anxiety/depression scores and development of complications could not be evaluated. These interpretations could possibly make in studies with larger sample sizes. In ENT surgeries which require short hospitalization in elective conditions, existence of anxiety has been found to have a relationship with postoperative pain. Easily applied scales give opportunity to diagnose the depression and anxiety status of the patients. Careful monitorization and pain relief in the postoperative period increases patient satisfaction. We would like to express our gratitude to Ali Çetin, M.D. for his contribution to statistical analyses and interpretation of this study. 1. Wu CL, Berenholtz SM, Pronovost PJ, Fleisher LA. Systematic review and analysis of postdischarge symptoms after outpatient surgery. Anesthesiology 2002;96:994-1003. 2. Bay-Nielsen M, Thomsen H, Andersen FH, Bendix JH, Sørensen OK, Skovgaard N, et al. Convalescence after inguinal hernioraphy. Br J Surg 2004;91:362-7. 3. Gramke HF, de Rijke JM, van Kleef M, Kessels AG, Peters ML, Sommer M, et al. Predictive factors of postoperative pain after day-case surgery. Clin J Pain 2009;25:455-60. 4. Edwards RR, Haythornthwaite JA, Smith MT, Klick B, Katz JN. Catastrophizing and depressive symptoms as prospective predictors of outcomes following total knee replacement. Pain Res Manag 2009;14:307-11. 5. Lautenbacher S, Huber C, Kunz M, Parthum A, Weber PG, Griessinger N, et al. Hypervigilance as predictor of postoperative acute pain: its predictive potency compared with experimental pain sensitivity, cortisol reactivity, and affective state. Clin J Pain 2009;25:92-100. 6. Ip HY, Abrishami A, Peng PW, Wong J, Chung F. Predictors of postoperative pain and analgesic consumption: A qualitative systematic review. Anesthesiology 2009;111:657-77. 7. Granot M, Goldstein Ferber S. The roles of pain catastrophizing and anxiety in the prediction of postoperative pain intensity. Clin J Pain 2005;21:439-45. 8. Taenzer P, Melzack R, Jeans ME. Influence of psychological factors on postoperative pain, mood and analgesic requirements. Pain 1986;24:331-42. 9. Perry F, Parker RK, White PF, Clifford PA. Role of psychological factors in postoperative pain control and recovery with patient controlled analgesia. Clin J Pain 1994;10:57-63. 10. Brodner G, Mertes N, Buerkle H, Marcus MA, van Aken H. Acute pain management: Analysis, implications and consequences after prospective experience with 6349 surgical patients. Eur J Anaesthesiol 2000;17:566-75. 11. Momeni M, Crucitti M, De Kock M. Patient-controlled analgesia in the management of postoperative pain. Drugs 2006;66:2321- 37. 12. Kiecolt-Glaser JK, Page GG, Marucha PT, MacCallum RC, Glaser R. Psychological influences on surgical recovery: perspectives from psychoneuroimmunology. Am Psychol 1998;53:1209-18. 13. Johnston M, Vogele C. Benefits of psychological preparation for surgery: a meta-analysis. Ann Behav Med 1993;15:245-56. 14. Kain ZN, Sevarino F, Pincus S, Alexander GM, Wang SM, Ayoub C, et al. Attenuation of the preoperative stress response with midazolam: effects on postoperative outcomes. Anesthesiology 2000;93:141-7. 15. Zhou D, Kusnecov AW, Shurin MR, DePaoli M, Rabin BS. Exposure to physical and psychological stressors elevates plasma interleukin 6: relationship to the activation of hypothalamic-pituitary-adrenal axis. Endocrinology 1993;133:2523-30. 16. Derbyshire D, Smith G. Sympathoadrenal responses to anaesthesia and surgery. Br J Anaesth 1984;56:725-39. 17. Halter J, Pflug A, Porte D. Mechanism of plasma catecholamine increases during surgical stress in man. J Clin Endocrinol Metab 1977;45:936-44. 18. Hopf HW, Hunt TK, West JM, Blomquist P, Goodson WH 3rd, Jensen JA, et al. Wound tissue oxygen tension predicts the risk of wound infection in surgical patients. Arch Surg 1997;132:997-1004. 19. Zigmond AS, snaith PR. The hospital anxiety and depression scale. Acta Psychiatr scand 1983;67:361-70. 20. Aydemir Ö, Güvenir T, Küey L, Kültür S. Hastane Anksiyete ve Depresyon ölçeg¢i Türkçe formunun geçerlik ve güvenilirlig¢i. Türk Psikiyatri Dergisi 1977;8:280-7. 21. Imasogie N, Chung F. Risk factors for prolonged stay after ambulatory surgery: economic considerations. Curr Opin Anaesthesiol 2002;15:245-9. 22. Wallace LM. Trait anxiety as a predictor of adjustment to and recovery from surgery. Br J Clin Psychol 1987;26:73-4. 23. Brander VA, Stulberg SD, Adams AD, Harden RN, Bruehl S, Stanos SP, et al. Predicting total knee replacement pain: a prospective, observational study. Clin Orthop Relat Res 2003;416:27-36. 24. Sadock BJ, Sadock V. Kaplanand Sadock's comprehensive text book of psychiatry. 8 th ed. Grillon C Anxiety Disorders: psychophysiological aspect 14.3. Philadelphia, USA: Lippincott Williams and Wilkins; 2005. p. 1729-39. 25. Ene KW, Nordberg G, Sjöström B, Bergh I. Prediction of postoperative pain after radical prostatectomy. BMC Nurs 2008;7:14. 26. Singh R, Ripley D, Pentland B, Todd I, Hunter J, Hutton L, et al. Depression and anxiety symptoms after lower limb amputation: the rise and fall. Clin Rehabil 2009;23:281-6. 27. Caumo W, Levandovski R, Hidalgo MP. Preoperative anxiolytic effect of melatonin and clonidine on postoperative pain and morphine consumption in patients undergoing abdominal hysterectomy: a double-blind, randomized, placebo-controlled study. J Pain 2009;10:100-8. 28. Levandovski R, Ferreira MB, Hidalgo MP, Konrath CA, da Silva DL, Caumo W. Impact of preoperative anxiolytic on surgical site infection in patients undergoing abdominal hysterectomy. Am J Infect Control 2008;36:718-26. 29. Kastanias P, Denny K, Robinson S, Sabo K, Snaith K. What do adult surgical patients really want to know about pain and pain management? Pain Manag Nurs 2009;10:22-31. 30. Ebneshahidi A, Mohseni M. The effect of patient-selected music on early postoperative pain, anxiety, and hemodynamic profile in cesarean section surgery. J Altern Complement Med 2008;14:827-31. 31. Mauer MH, Burnett KF, Ouellette EA, Ironson GH, Dandes HM. Medical hypnosis and orthopedic hand surgery: Pain perception, postoperative recovery, and therapeutic comfort. Int J Clin Exp Hypn 1999;47:144-61. 32. Roykulcharoen V, Good M. Systematic relaxation to relieve postoperative pain. J Adv Nurs 2004;48:140-8. 33. Seers K, Crichton N, Tutton L, Smith L, Saunders T. Effectiveness of relaxation for postoperative pain and anxiety: randomized controlled trial. J Adv Nurs 2008;62:681-8. 34. Moffitt TE, Harrington H, Caspi A, Kim-Cohen J, Goldberg D, Gregory AM, et al. Depression and generalized anxiety disorder: Cumulative and sequential comorbidity in a birth cohort followed prospectively to age 32 years. Arch Gen Psychiatry 2007;64:651-60. 35. Wittchen HU, Jacobi F. Size and burden of mental disorders in Europe-a critical review and appraisal of 27 studies. Eur Neuropsychopharmacol 2005;15:357-76. 36. Pelgur H, Atak N, Kose K. Anxiety and depression levels of patients undergoing liver transplantation and their need for training. Transplant Proc 2009;41:1743-8. 37. Oztekin HH, Boya H, Ozcan O, Zeren B, Pinar P. Pain and affective distress before and after ACL surgery: A comparison of amateur and professional male soccer players in the early postoperative period. Knee 2008;15:368-72. 38. Gupta A, Silman AJ, Ray D, Morriss R, Dickens C, MacFarlane GJ, et al. The role of psychosocial factors in predicting the onset of chronic widespread pain: results from a prospective population-based study. Rheumatology (Oxford) 2007;46:666-71. 39. Nicholson RA, Houle TT, Rhudy JL, Norton PJ. Psychological risk factors in headache. Headache 2007;47:413-26. 40. Munce SE, Stewart DE. Gender differences in depression and chronic pain conditions in a national epidemiologic survey. Psychosomatics 2007;48:394-9. 41. Hinrichs-Rocker A, Schulz K, Järvinen I, Lefering R, Simanski C, Neugebauer EA. Psychosocial predictors and correlates for chronic post-surgical pain (CPSP) - a systematic review. Eur J Pain 2009;13:719-30. 42. Jensen MP, Martin SA, Cheung R. The meaning of pain relief in a clinical trial. J Pain 2005;6:400-6. 43. Perkins FM, Kehlet H. Chronic Pain as an Outcome of Surgery. Anesthesiology 2000;93:1123-33.